What a lovely day I had today. I kind of hibernated and focused on the tasks at hand, finishing projects. First of all, I took the time to use the measurement schematics from my Rasta Jacket and wet blocked them on my fancy blocking board(i.e. the basement floor). Now mind you, I have a blocking mat but in this case I wanted the freedom to use as much space as I needed. On Saturday I started sewing the sleeves in without blocking, but decided that blocking was an absolutely necessary part of this garment looking its best. 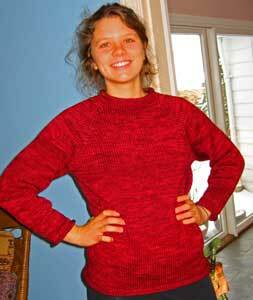 After consulting with the book "Seven Things that Can Make Or Break a Sweater", I sewed the sleeves in again. Once the sleeves were in place I knew I could pin and measure the pieces to match. I used a water mister to encourage the fibers to relax and stretch to measurements...a little patting to smooth out eased in seams and I left the piece to dry....hoping that the fit was going to be as excellent as my mind was saying it was going to be. The next task at hand was the Leigh Radford hat pattern. I had to finish the knitting today so I could felt and see how the "new" hat was going to turn out. Finish that I did and now it is in the machine to see if this time it will successfully fit my head. In my mind, part of startitis is the beleif that you can start and finish a project within a very short time. Of course though, this time does not include the luxury of mistakes. I have an example here. I adore the 1920's Ribbon Hat by Leigh Radford. 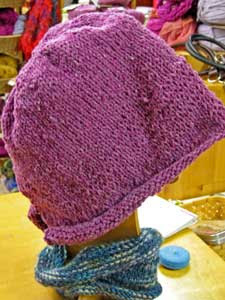 This hat is felted and uses the Imperial Yarn Columbia 2 ply. I decided that was going to be the first project I launched into. Finish it I did(as you can see by my pictures). The hat before felting, and the hat after. What I did not really think about before I started was the fact that I have a new fancy washing machine....So by all accounts I can tell you I have started and finished this hat and it is as cute as it looks. The problem however; as a shopowner with a high code of ethics, is that I have to tell you that my head is too small for the finished project. This is a polite way of saying this project after felting is still waaaaay too big, which of course you could never tell by my picture. I am confessing and telling you I am going to take another shot at the project with a different yarn that I know felts well...like Malabrigo worsted. I am also going to knit up a swatch of the leftover yarn and see if it will felt better if I knit it looser, though honestly that does not seem to make sense with the printed gauge. Stay tuned as I try to problem solve the final product(by the way, I looked it up on Ravelry and I saw at least one person where the hat turned out way too small).....sigh, the art of felting projects. The path is clear...let startitis begin!!! So, a knitting marathon is going on in my house. This is actually happening for a number of related/unrelated reasons. #1) My daughter Kelsey hit the the guilt button about her sweater " hey mom, not to be pushy or anything, but do you think you can make the sweater so I can wear it THIS winter?" #2) I want to start some new projects but I have at least 3 that are really close to completion and want to finish them but I can't because I first have to finish the reason for the marathon #1. #3) I want to get to my fiber spinning again and can't until reason #1 and #2 are done. 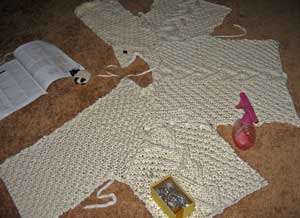 Here you will see the Knitting Pure & Simple Topdown for Kels in Madelinetosh Vintage in the color Tart. I gotta tell you this is going to be a difficult sweater to just hand over...so warm, cozy and brilliant in color....maybe I can borrow it sometimes! The sweater right next to the tosh sweater is my original topdown that I have to keep reclaiming from Kelsey's room. She borrows it and then just somehow forgets to put it back...hence her very own sweater is on the needles. The little bowl with nuts you see pictured is my abacus. My abacus is strictly for amusement purposes. 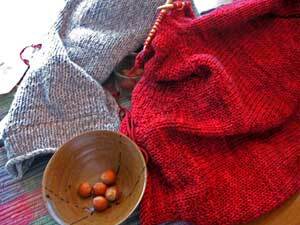 Alot of times when I am knitting nothing but stockinette I need little tasks to keep me working, so as I finish a round I move the nut out of the bowl to another location. Oddly enough it gives me instant gratification and I can amuse myself with the knitting and nutmoving much longer than if I just knitted and didn't keep track of myself. Kinda weird huh? The Schaefer Yarn Company is located in the Finger Lakes region of New York. They are a family owned business with years of experience creating fantastic silk, wool, wool blend and pima cotton hand-painted yarns. Their website offers examples of their patterns and yarn styles. Visit Schaefer Yarn Company at www.schaeferyarn.com. Meischay Elite is a great source for high quality Alpaca Yarns. Their yarn is made from their own Alpacas board and breed at Beachwood Creek Farm in Fowler, Ohio. 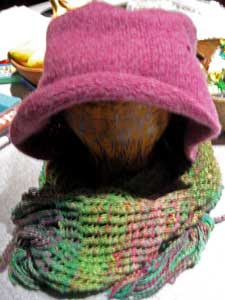 Their 100% alpaca fiber took third place at the 2010 Nationals for Fiber Arts & Skeins. If your looking for a quality American made, all natural Alpaca fiber visit purealpacayarn.com.